This DVD is perfect if you’d like to learn how to groom a Miniature Schnauzer, Standard Schnauzer or Giant Schnauzer. What a fully groomed Miniature Schnauzer should look like and what the DVD will teach you to do. Have a look around an ungroomed Schnauzer whilst Ewa points out what how to groom each part. A guide through all the tools required to groom a Miniature Schnauzer and suggests what tools she recommends investing in to successfully groom a Schnauzer. Learn the general clipping of a Schnauzer including clipping the Dog’s front, clipping the Dog’s rear, clipping the Dog’s ears and clipping the stomach. Learn how to cut around the edge of the ears, how to blend between long and short coat on a Schnauzer, how to cut in front of eyes and between eyebrows, how to clip between beard and cheek and how to cut the eyebrows. Ewa shows you how to cut the hair on the chest and successfully clip the Schnauzer underline. Learn how to cut the back of the legs, front of the legs and around the paws on a Miniature Schnauzer. Learn how to groom the tail and rear end of a schnauzer to show standard. Ewa discusses the differences and pro and cons between Hand Stripping or Clipping your schnauzer. Here she goes on to show you how to hand strip your own Schnauzer and the relevant techniques needed. If you wish to clip your schnauzers coat, this section will show you how to do it and suggest the tools you need to do it. Finally, Ewa shows you how go about the basic maintenance of looking after a dog and in particular a Miniature Schnauzer. She covers plucking inside the ears, brushing the teeth, clipping between the pads, how to cut the claws, general brushing and how to comb out the underwool. She also addresses how to behave and react whilst learning to groom and perform maintenance on your Schnauzer. Excellent DVD - buy it! You won't regret it! I bought this in August and have not looked back since. It explains very clearly how to go about the various parts of the dog and is good for either handstripping or clipping. Money well invested! This DVD is clearly articulated - Ewa's delivery is calm and well-paced - and the filming is also clear and extremely helpful. 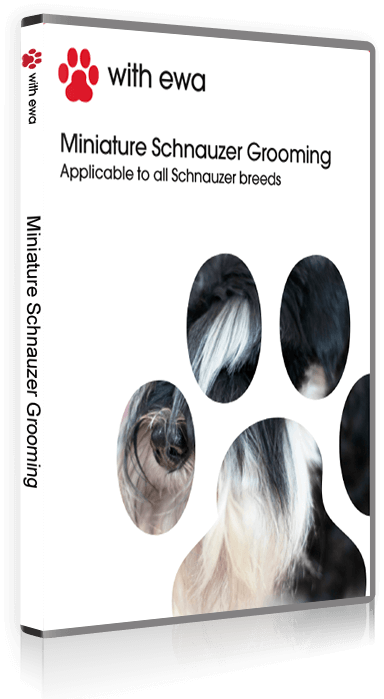 I would highly recommend this to anyone wanting to try grooming their own Schnauzers. I found the 'With Ewa' Miniature Schnauzer grooming DVD very easy to watch, as I found that everything was explained and demonstrated very clearly. The DVD is packed with lots of tips for the professional groomer, which will help them understand how to do the cut specific to the Schnauzer breed yet it is clear enough for the owner to follow along and have a go. The section on maintenance is very useful too. I recommend this DVD. This DVD covers the creative aspects of grooming a Schnauzer that you may not find in grooming schools and colleges. It will enhance your skills and like myself will enable you to find clients who love the professional look of their Schnauzers. Ewa shows you so clearly and easily how to get the best look from the Schnauzer you are grooming, whether that's with hand stripping or clipping. The Ewa Highland DVD for grooming schnauzers is very helpful. I have never owned a schnauzer and have never groomed any dog but this DVD was easy to follow. Very pleased with purchase. It has saved me money on grooming.